When the news of a 1 year suspension broke for Coach Payton, the initial reaction was “excessive; unfair”. It spawned a Free Sean Payton cottage tee shirt industry. However, as time went on and more information came to the fore, like seedy tapes from defensive coordinator Gregg Williams, it became understandable. Jeff Duncan of The Times Picayune attributed the harsh penalties to “hubris”, because the Saints were warned to stop the bounties on opponents in the locker room, and were less than forthright about it when it was investigated later. Let’s P.S. these tapes for a moment. If they were playback in a murder trial, the accused would deserve the death penalty. However, football coaches at all levels make this kind of noise all the time in efforts to galvanize and motivate players. More than anyone else, the players know it’s between the lines and it’s hardly ever taken literally. If there were a basket for all the heads that coaches have cried for, it would fill garbage dumpsters in several municipalities. Indeed, the more videotape looked at of play by the defense, the more punitive do the assorted punishments seem. The Saints ranked about 5th in the league over the past several years in related personal fouls, penalties, and fines; up there but not over the top. We still haven’t seen any evidence of any player whose career ended or was permanently maimed because of a dirty hit by a Saint. Nobody in Black & Gold took their cleats and stomped on a stricken opponent well after the play was over, like Albert Haynesworth of the Titans amd Ndamukong Suh of the Lions once did. When Kurt Warner got brutally blocked from the blind side after throwing an interception in a playoff game here, even a Saints fan cringed at the ferocity. But guess what – it was a great hit – and perfectly legal; how the game was intended to be played. Brett Favre looked just fine running around out there as the NFC Championship ticked down, after getting pummeled all evening (to his credit). Players’ union chief DeMaurice Smith is right to adopt a not so fast attitude with Commissioner Goodell regarding the pending suspensions of some twenty something players, which will affect the length and earning power of the rest of their careers. The locker room culture breeds complete deference to coaches, and in a mitigating capacity, Smith should indeed argue that Coach Williams’ directives were effectively mandates to the players, whose subservience was necessary to stay out of the dog house, which is always wide open for a player who doesn’t jump when directed, and to keep a job. Souls Of The Saints can almost picture some sweaty behemoth lineman sitting there in the locker room at halftime, listening to Coach Williams ranting about attacking some opponent, and feigning enthusiasm with a Right On, Coach! in an effort to appease as a “team guy”, when in fact all he is doing is catching his breath, tending to his pains, and loading up on liquids (and whatever other antidotes), calculating how to better combat the guy across the line of scrimmage from him in the second half, so he won’t get ripped in the film room by his coaches the following week. These guys get meticulously dissected and graded by position for every play on Sundays, which affects them much more than the team’s win loss record. That’s the corporate reality of pro ball. And everybody’s replaceable…. None of the above is intended to excuse the excesses of what transpired with the tired scandal known as Bountygate, but it is offered for perspective. The episode is summarily mindful of the Frenchman Albert Camus’ existentialist philosophy of the absurd, the paradox in this case being player bounties are hardly a requisite to win; they being essentially a sideshow. If there are long term positives to come from it, cheap shots are officially not hip, and coaches have received a think twice signal in general for the Little Hitler attitudes many of them have long possessed – at all levels of the game. Sean Payton is mindful of history, but being the only league head coach suspended for a full season for conduct detrimental to the game is not the kind he’d rather have been party to. He was reportedly shocked his suspension went over 4 games. Though he may have lost it anyway, his appeal for a lesser penalty should have taken place later, after all the bubbles, such as the tapes, quit popping about it. He is truly in exile and has to let the league know within 24 hours if he as so much texts anybody in the NFL. What will he do with his time? The oft used phrase about spending more time with the kids is p.r. redundant in this instance. One thing’s for sure; he will be watching…closely. He may do some TV but not be too thrilled with it. Somehow it feels his future with the Saints seems at risk, but not because of what happens with any interim coaches, or what this season’s team record will be. It’s just that time does things and changes circumstances in ways we will not comprehend until then. This is unchartered ground. But never let it be said that Sean Payton has been nothing less than great for the Saints, which he has been, and hopefully will continue to be. 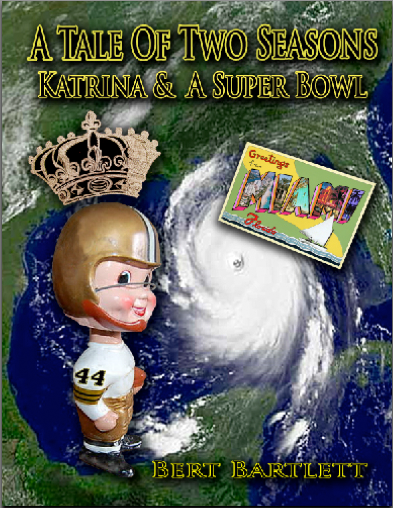 Not many coaches could have handled the multiple tasks of rebuilding the Saints Post-Katrina as successfully as he did, even if they had a Drew Brees, particularly in such a fan friendly manner. Since their inception, fans of the Saints have always yearned to have a coach to be in a position to go for it when it really mattered, like he did with the onsides kick in the Super Bowl, which is at the core of his legacy here. Payton may have built these Saints in his own aggressive image, but along the way he wrapped in the flavor and color of the city to the extent it is hard to envision him coaching on a sideline someplace else. Assistant Joe Vitt seems like less than an enthralling choice as interim coach, if only because he has his own suspension (6 games) to serve, too. Vitt is supposedly much more of a fire and brimstone type that X and O astute. The Saints simply need someone low key and level headed that can keep the attention of the players, help consummate the right game plan during the week, and make strategic decisions like whether to go for it on 4th and 2, or for a two point conversion late in a game. Coordinators Carmichael and Spagnolo will be left unfettered to do their thing. But having an Interim Coach II seems like an unnecessary distraction and adjustment. The head coaching job for 2012 here is similar to the cruise control that Barry Switzer had when he took over for Jimmy Johnson in Dallas in the 90’s, and the Cowboys won another title. Vitt was no great shakes when he was head coach of the Rams, and if he was chosen because he is perceived as not a “threat” to Sean Payton’s tenure here, it was the wrong reason. On the talent side, Super Gras 2009 suddenly seem like halcyon days long ago, with the departures of players like Carl Nicks, Tracy Porter, and Robert Meachem. Nicks seemingly was ably replaced by a former Baltimore Raven, Porter was injury prone and made fewer and fewer plays, and there are assorted candidates for Meachem’s spot (Marques Colston would have been a major loss at receiver). The loss felt the most here was linebacker Jo Lonn Dunbar, to the Rams. Dunbar has always had lots of physical ability but finally was just coming into his own as an effective player. Three new veteran free agent faces come to the position, which has been thin here for several seasons. Though they do not draft until Round 3 coming up this weekend, the Saint’s scouts may still come up with some good potential players in the low rounds of the draft and from those not drafted, as they traditionally have. At least there are no suspensions in that department. And yes, we are assuming a long term contract finally happens for Drew Brees. The Saints have been making news and gossip headlines this off season crossing Time, People, and Sports Illustrated. The franchise’s heir apparent and face of the future, Rita Benson LeBlanc, has reportedly been on the outs with the organization and the graces of her grandfather since the Super Bowl was won in 2009. That she has hardly kept any office time at the team facility since then was a very well kept secret, though ‘Dat seems like the least of the organization’s problems at the moment. Tom Benson just purchased the NBA’s Hornets, starting an I’M IN campaign for the local basketball fan base, and has the public disposition genteel look of an old guy who enjoys his toys, now resigned to the fact that he can’t take them with him. Did He Sink It? Besides his own pending suspension, Saints’ GM Mickey Loomis has now caught the attention of the office of U.S. District Attorney Jim Letten, reportedly for some wiretapping activity of opponents back in 2002 -’04 when they visited the Superdome. If there is anything substantial that results in some federal wiretapping charges for this, which is doubtful and nebulous at this point, it could be the nail to a coffin on his time here. Spying has long had its own unique niche history in the NFL, little fact, more fabrication, and plenty of paranoia and humor mixed in, though New England coach Bill Belichick had some substantial violations he essentially pled guilty with to the league several years ago. Pity Loomis. A new post on Facebook had a photo of him blamed for the sinking of the U.S.S. Titanic. Through it all, the image of the Saints has been besmirched but fundamentally has not changed. Since their existence, the Saints have always had a mistake prone, rogue element to their act, on the field and off. The charm is missing, and it will be awhile, but the pendulum will eventually swing in the other direction. The enemy at the moment is not Commissioner Goodell, the U.S. Attorney’s office, talking heads on TV, or anyone writing things which may further damage their reputation. It’s a brutal schedule of opponents in 2012, which we’ll delve into next time. Saints need to take their medicine and move on, bigger problem than suspension of HC was loss of draft picks. Saints need to get Brees under long term contract and go on HBO’s HARD KNOCKS!